I read somewhere that we don’t work through grief but that it works through us. 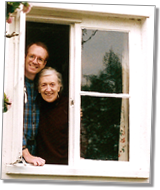 When my mother was diagnosed with cancer, my wife Katrin and I took her into our home. For five months we fought both to resist and to accept the inevitable. Each of us gave vent to our emotions in different ways, and all three of us kept a diary. I recorded the experience both to keep myself sane, and to keep hold of that sad, special time. The hours together were as precious as any love that anticipates death and I felt a need ­a compulsion to capture the thoughts, the emotions, the magnitude of a most common passing. Afterwards I printed out the pages, slipped them into a manila folder with my mother’s journal and put them away on the bottom shelf of my bookcase. For the next five years I could not open the folder. In time, I found the distance to read the diaries and to start to edit them along with Katrin’s words into this volume. Now all our thoughts are interwoven, my mother’s hand-written journal and Post-Its with our bubble jet typescripts. 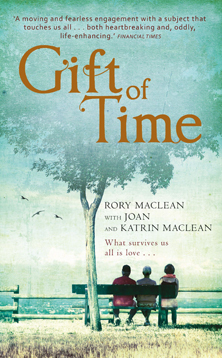 ‘Gift of Time’ is a way of bringing all of us together again.